Download this fantastic collection of teaching resources to help your children learn about materials! It includes a comprehensive topic guide, activity resources for your children to explore and reference materials for discussion and display! One 10 Page Materials Guide – Use this PDF / Powerpoint topic guide to learn about different types of materials and their properties. Also includes information about reversible / irreversible changes, dissolving, mixing, separating and inventing new materials! One Materials Glossary – An editable list of words linked to this topic with their definitions. Use it as a reference resource during lessons or delete the definitions and let your children write their own! Forty-Four Materials Vocabulary Labels – A collection of labels that show different words based on the topic, along with their definitions and related images. Add them to a classroom display or use them as a discussion resource in your lessons. One ‘Materials Matching’ Resource – Can your children identify the missing words in these ten sentences? Available at two different levels of difficulty, with answers for teachers. Sixty Materials Cards – A set of cards that show different objects. Can your children identify the materials that have been used? Can they describe their properties and explain why they were chosen to make each object? Two ‘Objects, Materials and their Properties’ Resources – Can your children identify the materials that are used to make the objects on this activity sheet? Can they describe the properties too? Twelve ‘Reversible and Irreversible Changes’ Posters – A set of twelve posters that show different reversible and irreversible changes. Can your children work out which ones are reversible and which ones are irreversible? These are also available as a smaller set of cards. Two ‘Reversible or Irreversible?’ Activity Sheets – Challenge your children to work out if these changes are reversible or irreversible. This activity sheet is available at two different levels of difficulty. One Set of Materials Bunting – Hang this bunting to decorate your classroom during your ‘Materials’ topic! Four Display Banners – Banners to add to the display boards in your classroom! 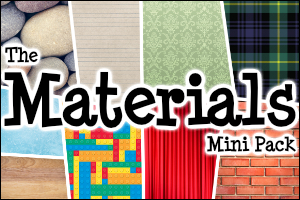 Watch the video below to view samples of resources from the Materials Mini Pack. Very comprehensive lesson on materials and their properties! Love the worksheets that come with the lesson. I think this will be a great addition to my Science program. Thank you for this comprehensive resource packet!!! Looks so professional. Keep it up! Just what we need - a solid set of resources for a popular topic taught across multiple year groups. Thank you!